Cygnett-Unison i-TS review | What Hi-Fi? 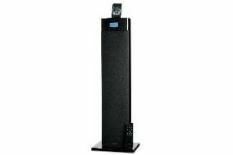 The execution of this 82cm tall floorstander leaves a little to be desired. Edges are rough and neither the unit itself nor the rubber control buttons inspire. Sonically, it's sadly not much to shout about either, though the treble puts up a fight, shouting its wares all too enthusiastically. Despite the size of the tower, there's not the bass depth or power we'd hoped for either. Tone controls allow you to try and rectify this, but increasing the bass volume predictably hinders rather than helps the quality on offer. Beaten for pure sound performance by cheaper desktop models and offering a slipshod finish, the Cygnett Unison i-TS tower simply doesn't stand-up to close scrutiny.